How do you move a 120 ton lodge 1,746 miles from Iowa to Montana? It helps if it’s already on steel wheels. The preparations for this cross country haul began at East St. Louis, before GN 441 was restored. As Utah 9013 was stripped of usable parts, it was fitted with good wheels with plenty of miles left. The air brakes, couplers and draft gear were inspected and brought into compliance with federal standards. 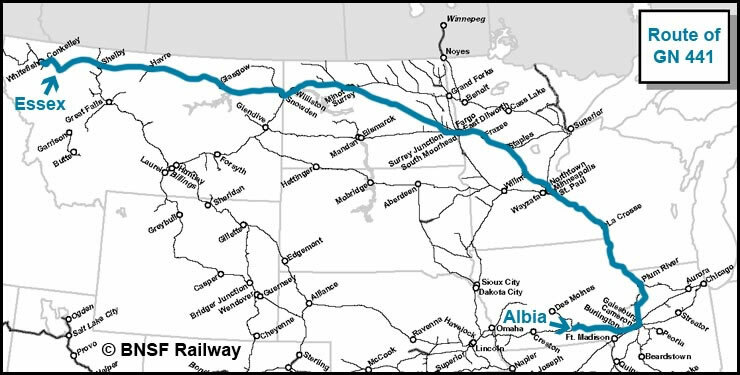 GN 441’s journey from Albia, Iowa, to Essex, Montana, took it through six states. 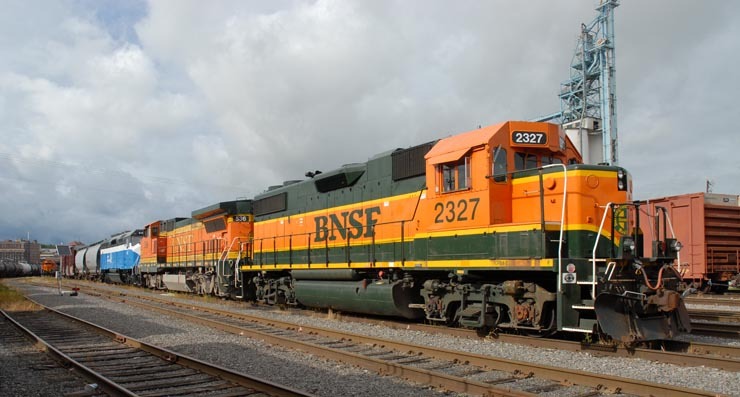 It rode on former Chicago, Burlington and Quincy lines from Albia to St. Paul, Minnesota; on the Northern Pacific to Surrey Junction (Casselton), North Dakota; and on the Great Northern the rest of the way. Click anywhere on the route to see a photo from that area. 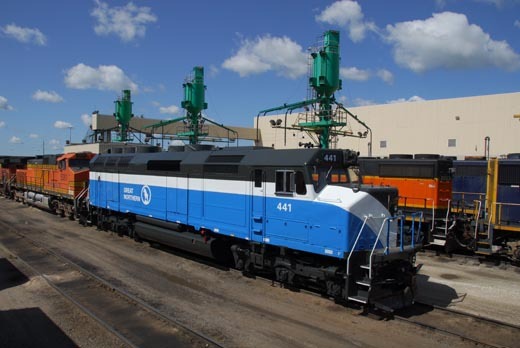 On the afternoon of Saturday, August 22, GN 441 stands out dramatically at BNSF’s diesel facility in Galesburg, surrounded by orange locomotives whose colors were inspired by the Great Northern paint scheme that Big Sky Blue replaced. 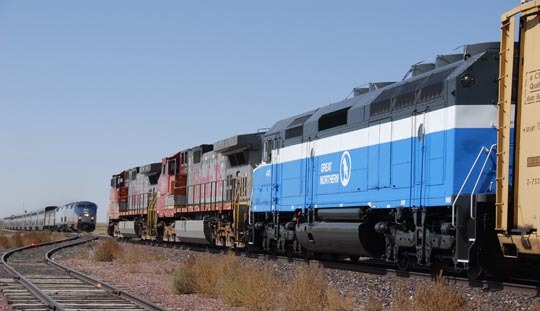 Other locomotives at right still wear Santa Fe’s blue and yellow, the colors GN 441 wore during most of its service career. At Plum River, Illinois, the Northtown train rolled onto the Aurora Sub, the mainline from Chicago to the Twin Cities. 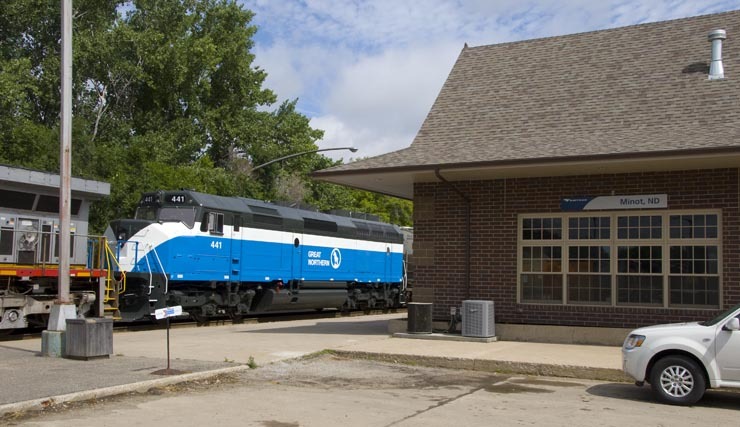 Just two miles away, the railroad converges with the Mississippi River at Savanna, Illinois, following it all the way to the Twin Cities – “Where Nature Smiles for 300 Miles,” as the Burlington Route’s Zephyrs advertised years ago. In the finest CB&Q tradition, the Northtown train ran like the wind through some of the Midwest’s prettiest scenery - but it was in darkness. 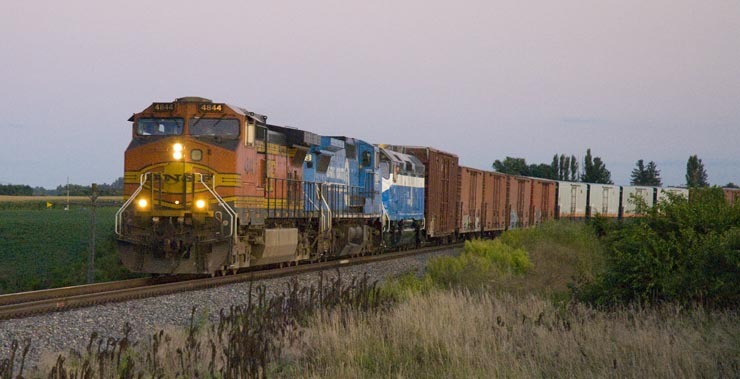 At Minneapolis, GN 441 was passed to manifest freight H-NTWPAS9-23, bound for Pasco, Washington, leaving Northtown Yard on the afternoon of Sunday, August 23. 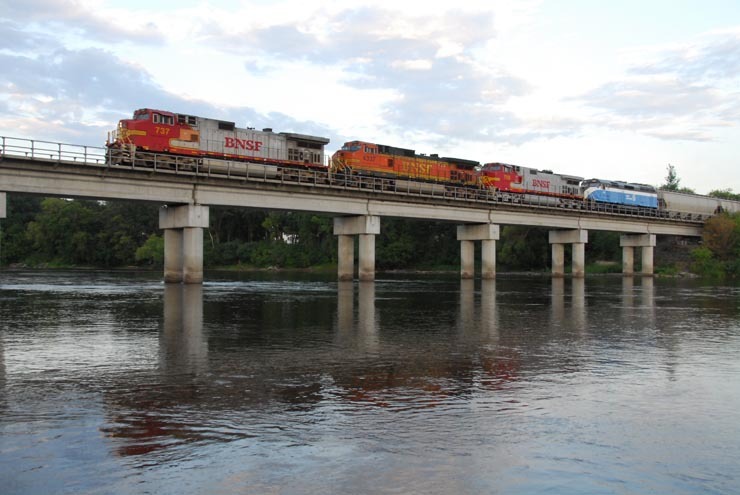 Just before sunset, GN 441 crossed the Mississippi River for the last time at Little Falls, Minnesota. Nighttime in the switching yard, at Dilworth, Minnesota, just east of Fargo, North Dakota. After a spirited run over the Staples Sub, the Pasco train paused for a crew change but left town shortly without picking up or setting out cars. 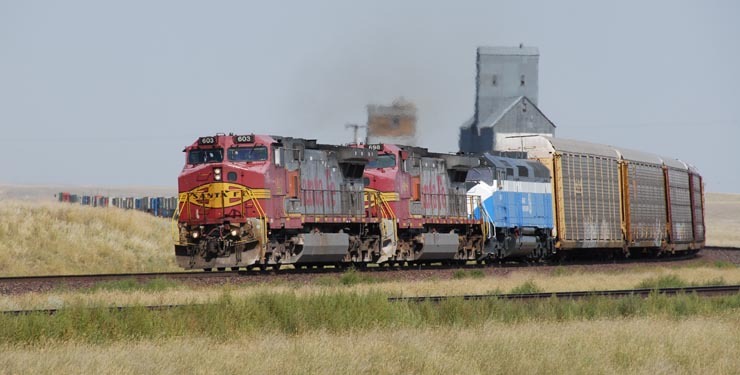 Early the next morning, Monday, August 24, GN 441 rolled onto the former Great Northern mainline for the first time at Casselton, North Dakota, and headed west on the Surrey Cutoff through high plains and coulee country. At Surrey, North Dakota, the Pasco train rolled onto the old GN mainline from Grand Forks, the route of Amtrak's Empire Builder. Seven miles west is Minot, North Dakota, an Amtrak station stop where all trains change crews. Here GN 441’s train entered the Glasgow Sub of the Montana Division; only 145 more miles to Big Sky Country. 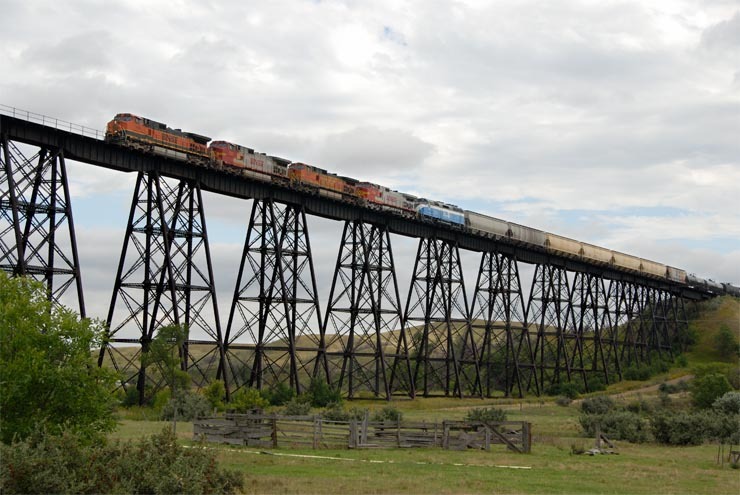 Just west of Minot, the train rolled over the 1792-foot-long, 117-foot-tall Gassman Coulee Trestle, one of many high steel bridges on the GN. Sunshine broke out as the train rolled through Big Sky Country west of Blair, Montana, following the Missouri and then the Milk River across Montana. 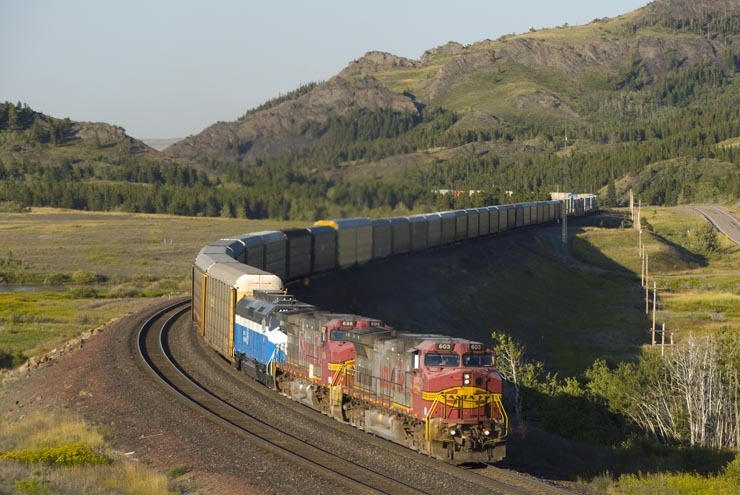 Thanks to a track maintenance window on Marias Pass that held the eastbound trains, the Pasco train ran with minimal opposition, arriving at Havre at midnight. 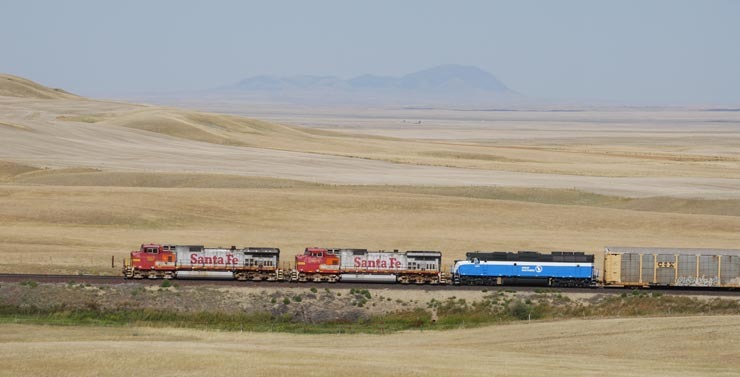 Around noon on Tuesday, August 25, GN 441 left Havre, Montana, on train V-CHCTAC1-23A, a vehicle train of new automobiles bound for the West Coast at Tacoma, Washington. This was a high-priority train from Chicago that carried double-stack containers behind the auto racks. 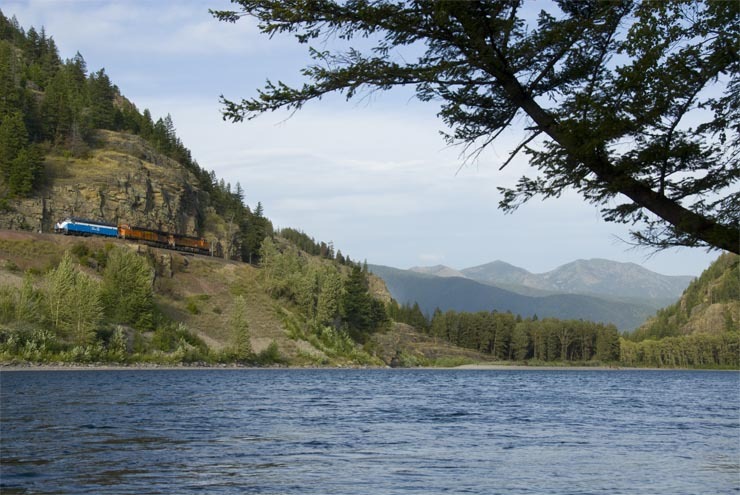 BNSF’s Hi Line Sub across northern Montana is a great showcase of modern railroading. The mainline from Chicago to Seattle, it carries an impressive amount of traffic for a single track line. A good Centralized Traffic Control (CTC) system and on-the-ball dispatchers keep everything moving. GN 441 paused only briefly at Burnham, Montana, to meet Amtrak no. 8, the eastbound Empire Builder. The vehicle train blasted through small towns like Lothair, thundering past their clusters of prairie skyscrapers. In this part of Montana, there’s usually a grain elevator somewhere on the horizon. Heading west across high plains, a palette of yellows from the winter wheat harvest, GN 441 passes the Sweetgrass Hills east of Chester, Montana. 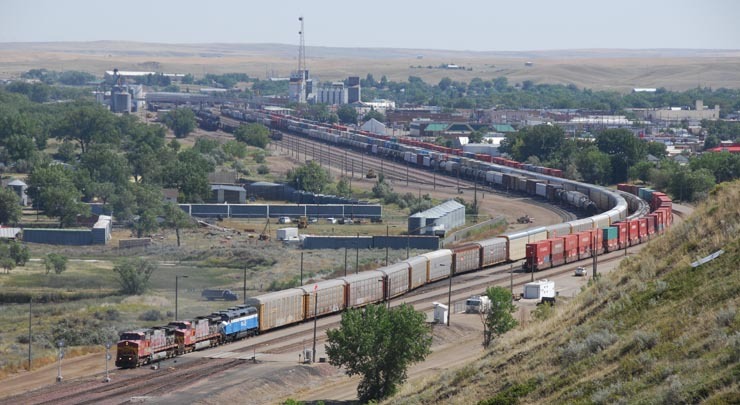 Shelby, Montana, is a station stop and crew change point for Amtrak’s Empire Builder – but not for freight trains. The vehicle train kept on rolling. Big Sky Blue in Big Sky Country! With the Sweetgrass Hills in the distance, GN 441 rolls west of Ethridge, Montana. The high plains give way to hills, then mountains, as the vehicle train approaches Glacier National Park. We’re between Spotted Robe and Grizzly, Montana; have to love those railroad names. 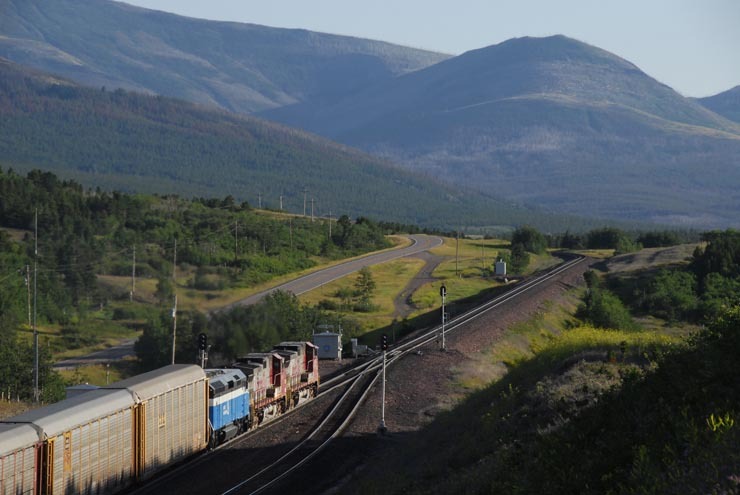 The railroad is the southern border of Glacier National Park, on the left side of the tracks. 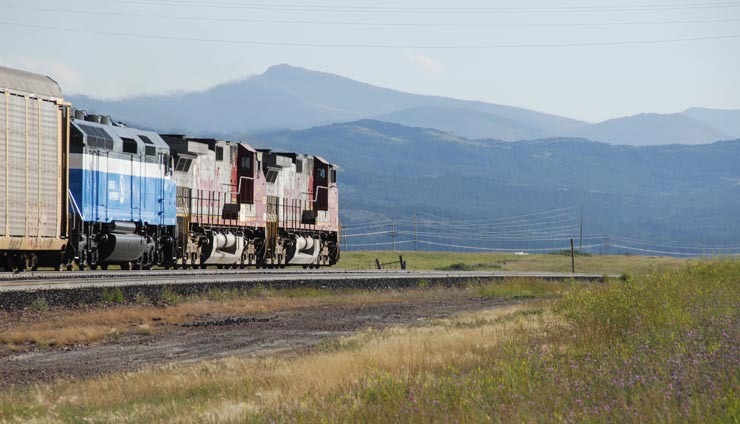 At a place the railroad calls Bison West, the two General Electric C44-9Ws are fighting their way to the 5,213 foot summit of Marias Pass. As the sun sank in the west, the Rockies rose to meet it. Still ahead, six miles away, is the Continental Divide. Right around sunset GN 441 passed the Izaak Walton Inn at Essex, Montana, meeting an eastbound train headed for the summit. 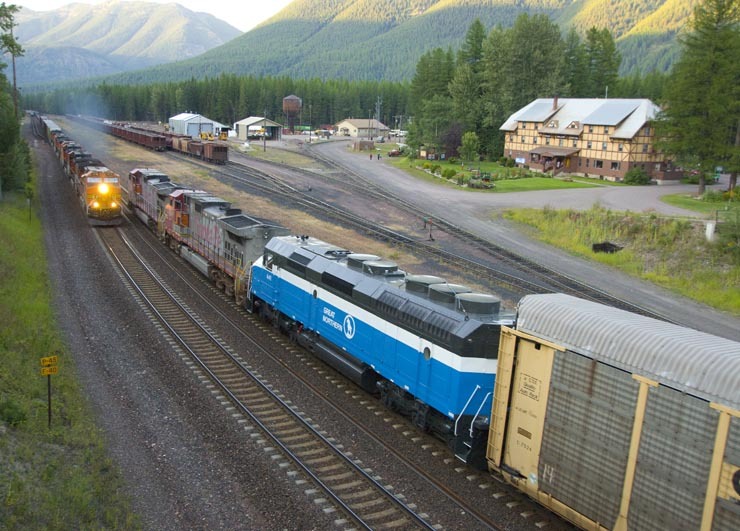 The vehicle train was not much more than an hour ahead of Amtrak’s westbound Empire Builder, and stopping a freight train on a mountain is a good thing to avoid, so they took GN 441 another 47 miles west to Whitefish, Montana. Note the protective covers on the 441’s skylights. 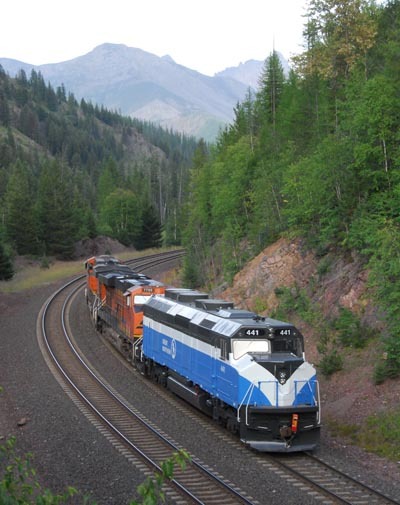 The vehicle train set out GN 441 at Whitefish, Montana, changed crews, and headed west behind the Empire Builder. The next afternoon, Wednesday, August 26, a set of two helper locomotives hauled GN 441 back up the mountain; at Conkelley, Montana, they’re following the Flathead River up to Essex. 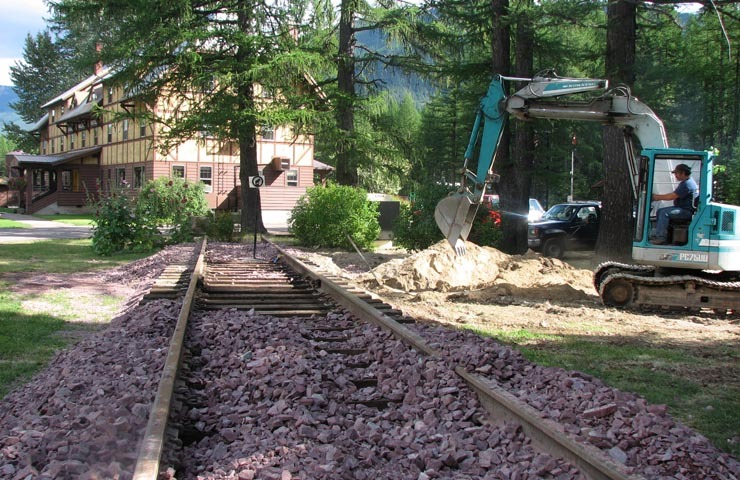 K-ESXESX1-26A, are used to help move heavy trains over Marias Pass - both in power uphill and dynamic braking downhill, when the locomotive's traction motors are turned into generators to slow the train and keep it under control. After being fueled and serviced at Whitefish, they’re returning to their home base at Essex, where the eastbound grade gets steep. The train is moving away from us east of Nyack, Montana; GN 441 is being pulled backwards by the helpers. Note the “Fred” (Flashing Rear End Device) in the 441’s coupler. Besides flashing red warning LEDs at night, Fred informs the engineer of the brake line air pressure at the rear of the train. 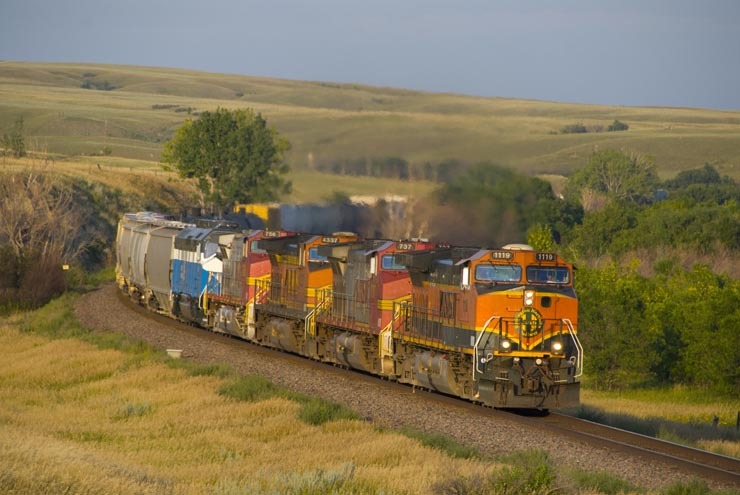 This is important information because freight trains are often over a mile long. We saw the first trip of this locomotive, 41 years earlier. This is its last trip. 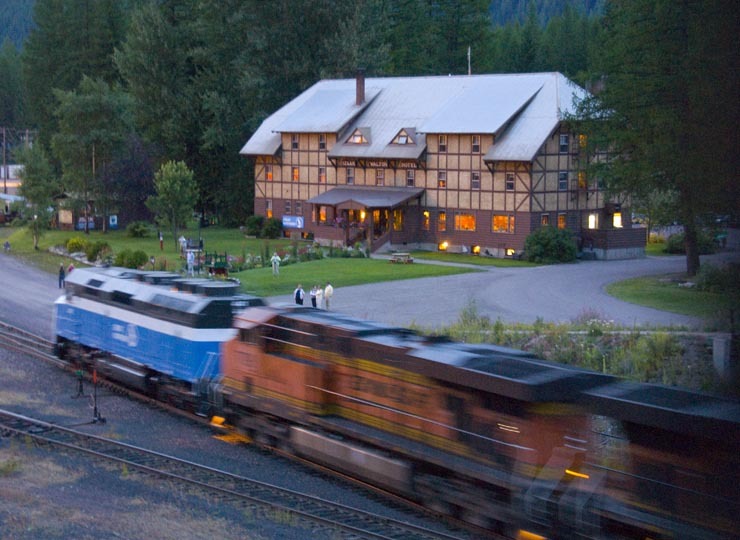 Dozens of guests watched as the helpers pushed the 441 past the Izaak Walton Inn, blurred by a half-second exposure in the twilight. After a safe, damage-free trip on BNSF halfway across America, Great Northern 441 has come home to a place it probably has never been before. Moving GN 441 the final few hundred feet from the North American railroad system to this track will cost more, in money and especially in nerves, than the trip from Iowa to Montana.